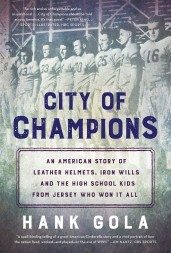 Tatra Press is pleased to announce the forthcoming publication of veteran New York sportswriter Hank Gola’s City of Champions: An American story of leather helmets, iron wills and the high school kids from Jersey who won it all (Tatra Press, November 2018). Now available for pre-order from Amazon.com, BN.com and Indiebound.com. “I love stories that transport us back in time vividly, and particularly stories that time forgot with heroic twists. [Laura Hillenbrand’s] “Unbroken,’’ with athlete-turned-World War II POW Louis Zamperini, is a classic in that genre.